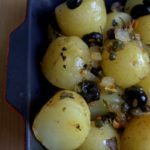 Roasted new potatoes are delicious; capers and olives add an extra layer of flavour. Boil the potatoes whole for about 12 minutes until soft, drain and slice in half. Whilst the potatoes are boiling fry the onion in olive oil until translucent and starting to caramelise. Put all the ingredients into a roasting dish, mix well, drizzle with olive oil and season with pepper and salt. Roast in a hot oven (GM5/190C/375F) for about 30 - 40 minutes until golden. Variations Use different herbs or green olives. I think that it would be lovely with lemon.